For Pretoria based real estate agents, Arlon Properties, keeping up with the growing student accommodation demand is vital to their business. Established in 1991, this agency has made it their business to supply rentals and investment properties in the vicinity of the University of Pretoria and with their new Flex responsive website, they will be able to keep up with the mobile generation. Backed by hours of innovative development and groundbreaking Cloud Infrastructure their new Vision-themed website allows them to put the focus on what is important - their property stock in one of the most in demand property nodes in Pretoria. The key feature of their new website is its responsive technology that allows the site to adjust and adapt to any screen size it is viewed from, without compromising the aesthetic and most importantly functionality of the website. This eliminates the need for an additional mobile website and also assists with SEO. Other features include an easily navigated news section, easy-to-use calculators that visitors can use to calculate monthly bond repayments and affordability with and property alerts. 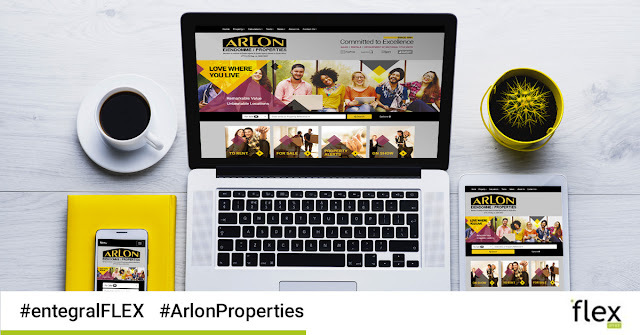 Arlon Properties also makes use of our Office Management System (OMS) that a to lows them manage all of their office data from anywhere and also to publish all their listings across our syndication network, including MyProperty and their own websites with the click of a button! If you are ready to make your move towards a more reliable, effective and efficient way to manage and showcase your listings, visit www.entegral.net to contact us or request a quote today!